Tina and I had lunch at a Japanese Restaurant called Haiku (9300-9900 IH-35 South, Austin, TX‎ - (512) 291-5600‎) in the Southpark Meadows shopping complex in South Austin. Since they've been pushing their sushi rather hard online (going so far as two have a couple dozen suspicious CitySearch reviews), I decided to focus the meal on their sushi. I ordered maguro (tuna) nigiri, hamachi (yellowtail) nigiri, and sake (salmon) nigiri to taste the freshness of the fish as well as the rice (sushi). The fish was a little softer than I like it, but fresh enough to not be mushy. The visual appearance was some what startling - the tuna was almost glistening while the yellowtail just looked odd (almost brownish). The color of the yellowtail looked much worse in the dim yellow lighting where we were sitting and the color corrected photo shown below makes it look alright (even though it still looks a bit off to me). The yellowtail, like the other fish, tasted just fine - mild and fresh with no textural deficiencies such as stringiness or sliminess. The sushi itself was good enough that I don't have the palate to determine if anything was missing or imbalanced. The rice held together easily without being sticky while maintaining their individual grains. It was seasoned with just the right amount of vinegar, and I couldn't detect any variation in seasoning levels (a good sign that the vinegar was evenly distributed). My only issue with the sushi was that there was too much of it for the nigiri. Tina had trouble chewing after sticking the nigiri into her mouth. Maybe in Texas you're supposed to take more than one bite or Texans have larger mouths. I also ordered one of their specialty rolls. The Kyle Roll (selected because I currently reside in Kyle, Texas) is "spicy salmon, avocado, and smelt roe wrapped with wasabitobiko, more salmon, and fly fish roe on top served with chili sauce". It was also pretty massive (again barely fitting each piece whole into our diminutive mouths). Here's where I'll describe service a little. Our waitress, although friendly, didn't provide us with much guidance except that she thought the Kyle roll was a good one. She failed to mention (until after almost all of the roll had been eaten) that the tobiko on top of the had various seasonings including wasabi (which we expected), lemon, unflavored, and habanero (which Tina discovered the hard way). After Tina was breathing fire and trying to figure out how to stop the painful burning, our waitress mentioned that each tobiko was different and one of them was habanero that "can really get you". Important information that if given to us prior to eating would have not only prevented Tina's predicament but also provided us with enough of a focus point that we would have enjoyed the dish more as we payed attention to the different flavors. The use of sriracha chili sauce on a sushi dish is novel to me, but I liked it. I followed this up with what I thought would be a "classic" roll - the Dragon Roll. The dragon rolls that I'm familiar with are made with tempura shrimp, cucumber, and avocado wrapped inside nori and sushi and topped with unagi. This one was snow crab with crabstick (imitation crab), unagi, and asparagus wrapped inside nori and sushi topped with avocado… what I know as a caterpillar roll. 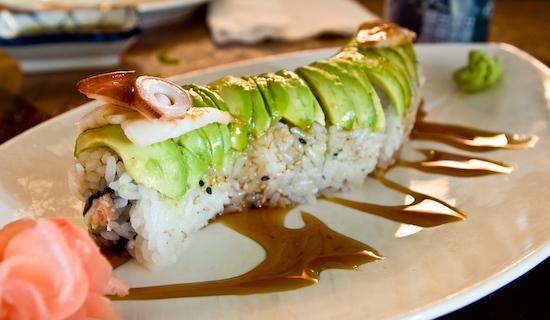 I'd be interested in hearing from my readers (if any of you have actually read this far) what you think a dragon roll is supposed to be. I might be completely wrong. Oh, right, I forgot to mention that their dragon roll is of normal size (not the oversized pieces that barely fit in our mouths) and pretty good except for the sweet sauce it was served with. It was just a bit too sweet. Next time, and I'm pretty sure there will be a next time, I'll order it without the sauce. 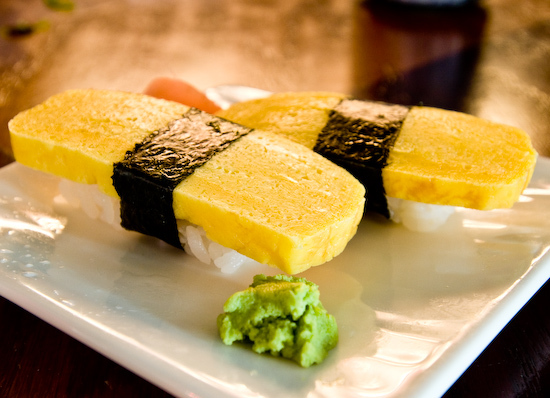 I ended the meal with tamago (egg) nigiri. The tamago was not made in house, but they did order theirs from a decent manufacturer since it tasted well balanced - mildly sweet with a hint of rice wine - and had good texture, firm but easily yielding with the feeling of layers as you bite through. On the whole, I found Haiku served decent, but I wouldn't go as far as to call it good or great sushi. Since it's the closest sushi place to where I currently live, it's price is reasonable, and I don't have any major problems with it, I think I'll be coming here whenever I need a sushi fix. For dinner, Tina and I went back to trying to get used to cooking again. Although, still frustrated with the sink, it didn't really affect me as much tonight as it did last night. Instead of unpacking the fluid measuring cups (apparently in a different box than my dry measuring cups), I opened a package that I received today: a new 11-lb. capacity digital scale from a company called EatSmart. I received a white glass top scale and used it to measure out the water for my rice. The whole top surface of the scale is glass (which made for really easy cleaning) and there's only two "buttons" (really touch sensitive surfaces): Power and Tare. Pretty much all you need, but I do like having the ability to change units easily. Unfortunately, the button for that is on the bottom of the scale and seems impossible to press while something is on the scale. The digital readout is quite large and easy to read. I'll keep using the scale a while longer and see if its response is as fast as my MyWeigh scales. If so, then I'll be adding them to the scale recommendations on Cooking For Engineers. 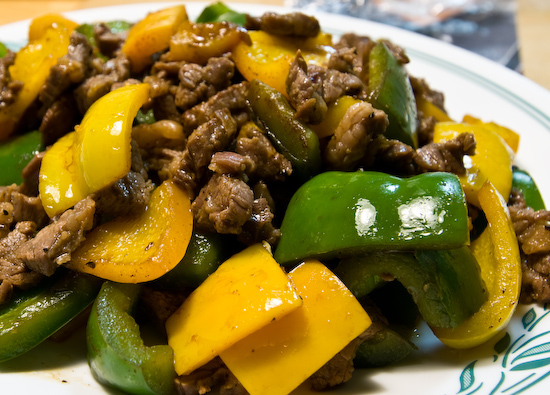 I whipped up a pepper beef dish (flank steak marinated in soy sauce and freshly ground black pepper stir-fried with yellow and green bell peppers). 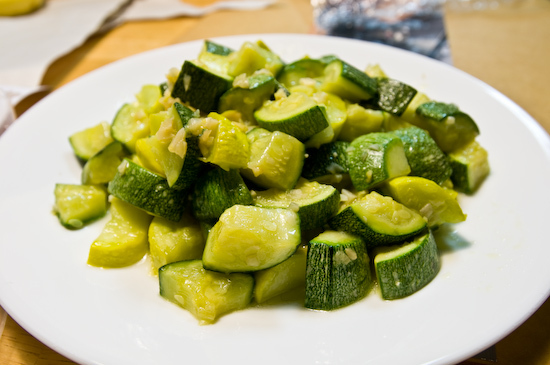 Tina cooked summer squashes (cousa squash and yellow crookneck squash) sauteed with garlic. whoa. That hamachi looks sick. As for the dragon/caterpillar thing…when I come across "dragon" on an asian menu, I assume it's shrimp/prawns…that seems to be the standard…I think your local place has it wrong. 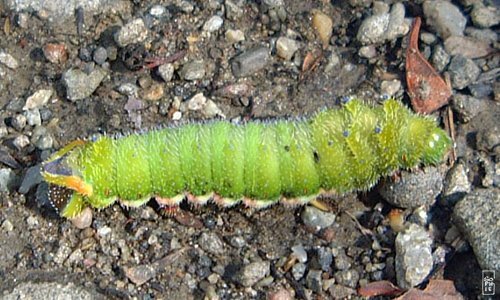 It even looks like a caterpillar. 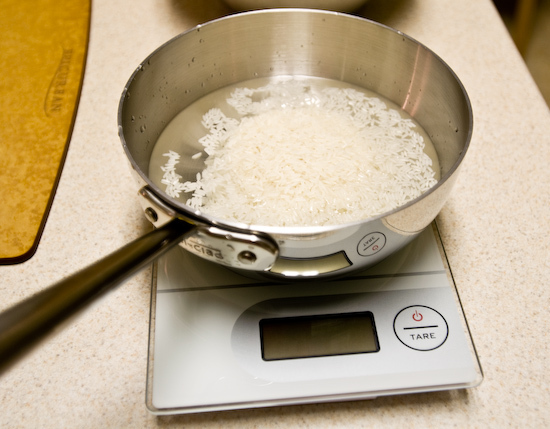 I have a similar scale, (http://www.amazon.com/Salter-Digital-Pound-White-Kitchen/dp/B000XS11RA/ref=sr_1_29?ie=UTF8&s=home-garden&qid=1240619779&sr=8-29 except mine is in red) and after almost a year of using it, I would recommend who is looking to buy a scale buy one with dedicated buttons. Turning the scale on and off is actually a challenge most of the time and will even turn on/off if you lift the scale off the table. I hope the one you received has a better responsiveness. I haven't used that particular Salter, but most of the Salter scales take a long time (about 3-5 seconds) to provide a read out. That's too long of a delay to use when pouring ingredients. For that reason, I don't recommend Salter. Does the Salter's on/off button depress at all or is it under the glass top (so you brush the glass top and it activates)? I haven't had an on/off issue with the new EatSmart scale, but we'll have to see as I continue to test it. That sushi does not look appealing at all. I'm glad it wasn't as bad taste-wise as it looks. 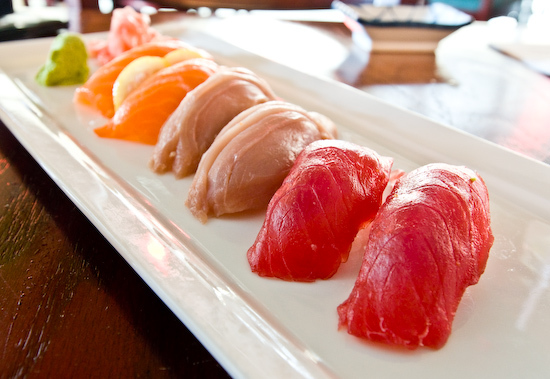 But personally for me, the nigiris were way too fake looking in color (too red for the tuna, too orange for the salmon, and the color on the hamachi was just weird). 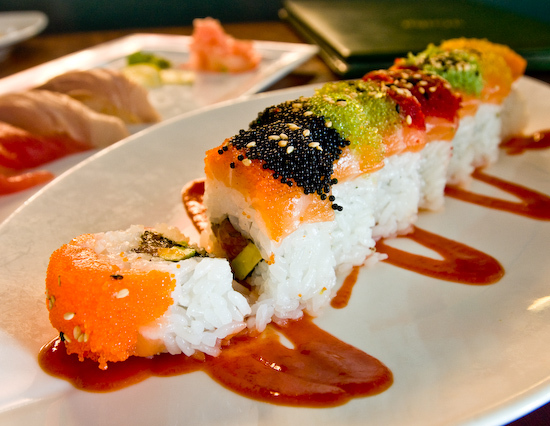 And that roll with all the funky colored tobiko-that looked all wrong too.